Teachers today are busier than ever before. Each teacher may have up to 30 students in one classroom. Two or three of these students, in addition to your child, may have special needs. An additional one or two may be at risk for learning and behavioral challenges like attention deficit disorder and ADHD. Teachers are increasingly required to teach to strict state standards of learning that emphasize core subjects like reading and math. Accountability to state testing requirements, even at the elementary school level, is the norm rather than the exception. As a result, it is important to build and cultivate strong relationships with your child’s teachers. You can help your child succeed by helping his or her teacher understand autism, your child, and the impact of having a child with autism in the classroom. Through your years of experience, you have become informed about autism and are an expert on your child. The teacher surely will appreciate your establishing a pattern of efficient and respectful communication. This exchange of information can take place in the form of in-person meetings, telephone calls, e-mails, audio tapes, or journal exchanges. You can provide teachers with essential information about your child’s sensitivities and behavioral challenges. You can communicate about the areas where your child struggles and which adaptations have been successful in the past. Do not assume that your child’s teacher understands what autism is and how it uniquely impacts your child. The first and best source of information your child’s teacher will have about your child is you. A vital first step in creating a strong relationship with the teacher is by reaching out to discuss your child and how autism affects their everyday life. It simply starts there. The only way to maintain and build that bond is through communication, teamwork and trust. By providing teachers with information on your child’s abilities and autism, and working with them to make the best use of resources like OAR’s Educator’s Guides, you can make their job just a little easier, and they will love you for it. Consistent and frequent communication between you, your child’s teacher and the school will help ensure that the classroom and the schoolhouse become comfortable and productive places where your child will learn and grow. 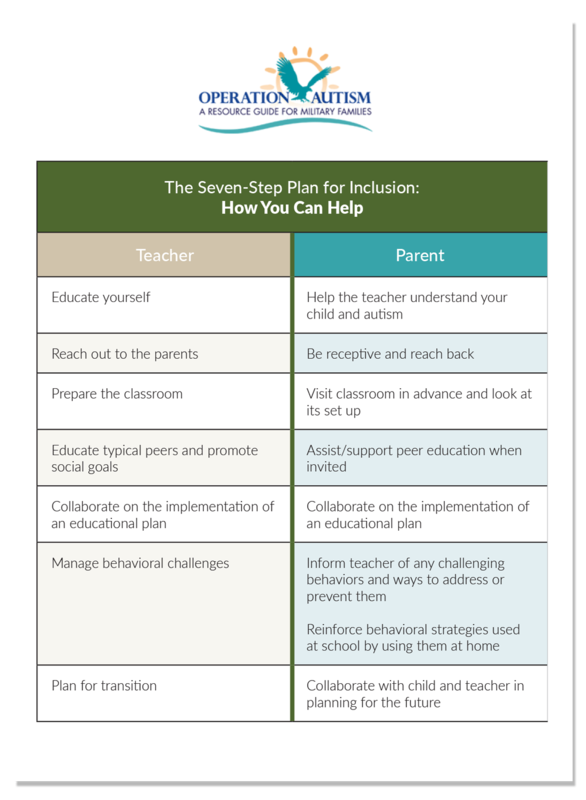 Below is a seven-step plan for inclusion in the classroom. You can be of great assistance to this process.